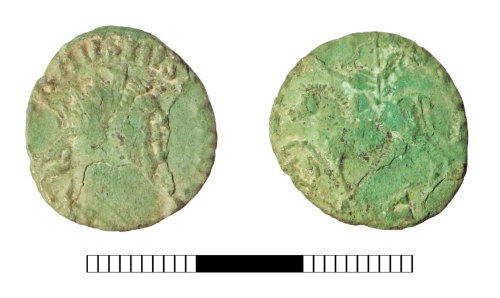 A worn copper-alloy Roman radiate of Carausius (AD 286-293), dating to the period AD 286-293 (Reece Period 14). ADVENTVS AVG reverse type depicting the Emperor riding left, right hand raised, left hand holding a sceptre, at foot a captive. Mint: C Mint. As RIC V.2, p. 481, nos. 190-191.